Uppgifterna du fyller i kommer att granskas av en administratör och måste godkännas innan ditt event blir synligt i kalendariet. The information you enter will be reviewed by an administrator and must be approved before your event becomes visible in the calendar. This workshop will be directly relevant to everyone involved in analytical measurements in laboratories such as industry, pharmaceutical, medical, environmental, food, and academic. The main topic is validation of analytical methods – both non-targeted, where the question is more general such as determination of any organic contaminant in matrix y and targeted, where the issue is clearly defined as such as determination of x in matrix y. In addition to the presentations, participants will be given ample opportunity to discuss these subjects in detail and exchange experiences in a number of working group sessions. 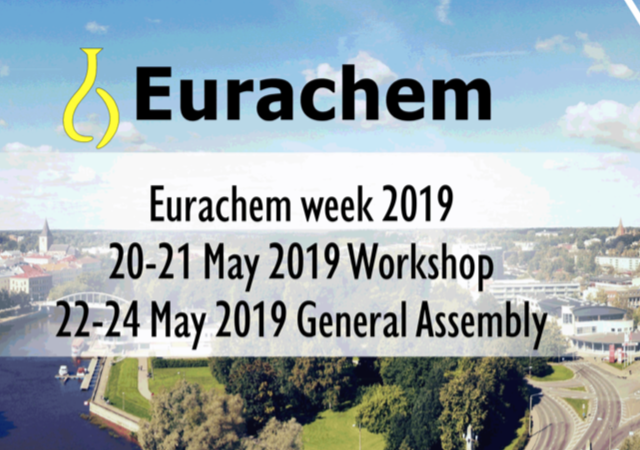 Rapid Communications in Mass Spectrometry will publish a special edition covering the highlights of the Eurachem 2019 workshop. Full papers, reviews as well as posters together with one page summary are invited. Submission deadline 30th June 2019.